“I’m all in favor of keeping dangerous weapons out of the hands of fools. 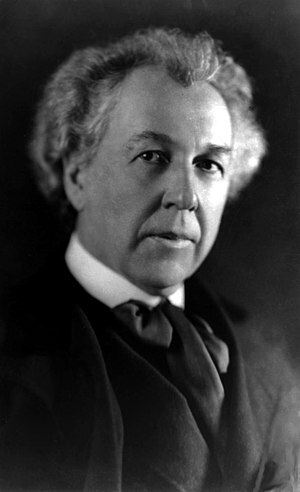 Today is Frank Lloyd Wright’s birthday, he would have been 145 years old. This entry was posted on Friday, June 8th, 2012 at 11:23 am	and tagged with Frank Lloyd Wright, Thought of the Day and posted in American History, Architecture, Frank Lloyd Wright, Non Fiction, Thought of the Day, Today's Birthday. You can follow any responses to this entry through the RSS 2.0 feed. Considering what the press did to Wright, can’t say I blame him for his opinion. The TC Boyle novel on Wright I thought was pretty good, by the by, and I usually think Boyle falls short. Ohh, I haven’t read The Women. I’ll have to get that out of the library (or from the bookstore. ) I just looked up a review and it sounds fascinating. I did read Loving Frank for book club and that was pretty good. Have you visited any of FLLW’s houses Peter? I can think of a bunch of current bestselling authors who should never be allowed near any word processing device. I have one in particular in mind but I’m not naming any names here.